Researchers at Gunterman Polytechnica will unearth long forgotten foundational documents that show the creators of the Grand Bargain intended to establish workers' comp as an “Elusive Remedy”, rather than the previously believed Exclusive Remedy. Somewhat embarrassed, the industry will realize we've been getting it right all along. This stunning discovery will mean the Florida Supreme Court has no cases left to review, and has kept us waiting for nothing. Despite being labeled as a “non-starter” by self appointed experts such as myself, Medical Travel will gain a strong albeit brief foothold in the workers' comp industry in 2016. Hundreds of our most demanding injured workers' will be schlepped to Turkishmaninacanstan to receive somewhat competent and exceedingly cheap medical care. The short lived effort will ultimately fail, however, when injured workers' attorneys insist their clients be given round trip tickets, instead of the one way fares they were originally provided. The stunning revelation will send shockwaves across the country, as people demand that workers' compensation employee salaries “should instead be used to treat injured workers”. To appease the angry masses, salaries in the industry are eliminated. This frees up many dollars that are then distributed to injured workers, which makes everyone's job extremely easy. Lawyers voluntarily eliminate all fees. Doctors work for free. Pharmaceutical companies donate their drugs. Everyone continues working because it just feels so darn good. The year ends with everyone joining arms in the town square and singing Kumbaya while the Grinch and his dog return Christmas to the village. After many years struggling with a difficult name and an almost impossible acronym, the Rebranding Committee of the IAIABC will announce a new name for the organization. The associations new moniker will be “Fred”. Rebranding Committee Chair Peter Federko will explain, “Streamlining our brand has been of utmost importance to our organization. The goal given our committee when it was established in 1977 was to work with expedience in order to accomplish this task.” Federko will explain that Fred doesn't actually mean anything, but it is something residents of Saskatchewan will be able to remember. In an unrelated action, Saskatchewan will be renamed “Bob”. A brazen attack by radical terrorists will target a large industrial complex with highly lethal chemical weapons. Unfortunately for the terrorists, they will choose to launch the chemical attack in northern New Jersey. No one notices. California legislators will once again fix the state's workers' comp system; simplifying it by adding 1,443 pages of new legislative code. A crowning achievement of this effort will be the IMRR, or the Independent Medical Review Review. This process will streamline and improve medical care by reviewing the reviews of the IMR reviewers. Experts declare this will lower costs even further by eliminating unnecessary procedures, mostly because patients will be dead by the time the procedures are approved. Long an impediment to improving process and reducing costs, injured workers' will be removed from the claim process entirely in 2016. Culminating a move started some 20 years ago, this final step will bring true efficiency and cost savings to the workers' comp industry. Experts will note that continued consolidation and technological advancements have essentially rendered the injured worker obsolete, making them no longer relevant to the process. Reflecting the sheer idiocy of those US medical professionals who continue to slather unneeded narcotics on an unsuspecting populace, opioids will be renamed dopioids to better reflect the intelligence level behind their continued overuse. In the last year of it's final term, the Obama Administration will issue a series of Executive Orders that federalize the workers' compensation system. 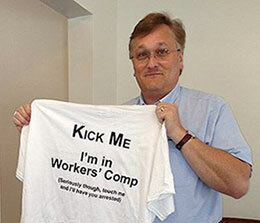 ProPublica reporter Michael Grabell will be appointed as Federal Workers' Compensation Czar. Things get off to a rocky start when all files are ordered transferred to Lois Lerners' hard drive, and all industry emails are routed through Hillary Clinton's bathroom. The National Conference is moved to a Motel 6 in Detroit. All other conferences are cancelled, as continuing education is deemed a waste of resources that could instead help injured workers. Employers will have to buy insurance via HealthCare.gov, meaning most employers will no longer be able to obtain coverage. The task of simplifying and standardizing statutory code is given to the Centers for Medicare & Medicaid Services, or CMS. Unable to immediately determine what the standards should be, the agency will manage to establish heavy fines for violating whatever procedure they may someday determine appropriate. Workers' comp professionals who fail to fully cooperate will be shot, which, ironically, will be a compensable injury. And the rest won't. Explanations should not be necessary. There have been 8 comments made!